Very beautiful and comfortable apartment. Mike was very polite, friendly and helpful. Great location. Host was waiting for us, and handled transactions promptly and was very helpful. Apartment was excellent. Will definitely be back again. Thanks for the privilege to stay. We thoroughly enjoyed our stay here. 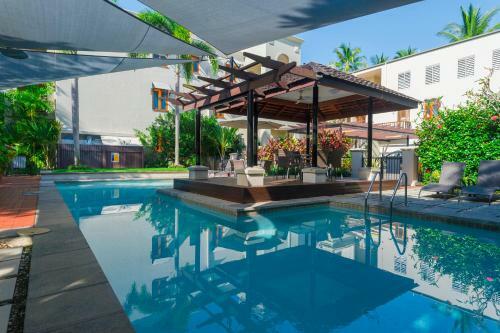 Very quiet location with easy access to marina and tours and to downtown for shopping and restaurants. We also went as far north to Cape Tribulation - roads were well marked on how to drive there from this location. We were able to relax and enjoy the accommodation after a long flight from Perth. The owners contacted us and we were able to let ourselves into the suite early which was very much appreciated after our flight with a 2 hour time change . The owner met us and gave us some hints on the area which was appreciated. Our thanks to the owners for allowing us to use this accommodation. Would highly recommend for short and long term stays as it has a very good kitchen set up. The large interior space, balcony, location, all day everyday shuttles ($3 pp), walking distance to main town & the quiet environment. The apartment was close to the beach, away from the crowds. Really easy to communicate with the host. The pool and outside area was lovely. Very clean and spacious apartment. Would definitely stay again. Being like home from home in a clean, spacious area, great pool and outside area, friendly staff, being near to 4 mile beach and Port Douglas. The appartment was spacious and bed was extremely comfortable. 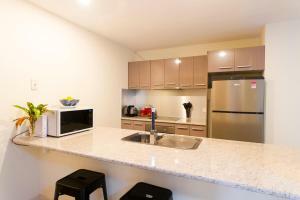 Kitchen fully equipped also washer and drier. Pool was great, not too many people using it. The room was average, facilities were ok, many stairs. Super schoon appartement met veel privacy.. Prettige en snelle check in. Goeie wifi, prwchtige badkamer, mooi zwembad. 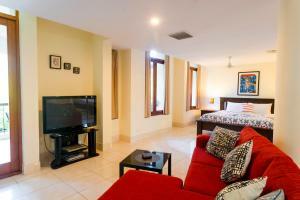 Lock in a great price for Luxury 1 bed Apartment, new King Bed & Bath – rated 8.8 by recent guests! Luxury 1 bed Apartment, new King Bed & Bath This rating is a reflection of how the property compares to the industry standard when it comes to price, facilities and services available. It's based on a self-evaluation by the property. Use this rating to help choose your stay! 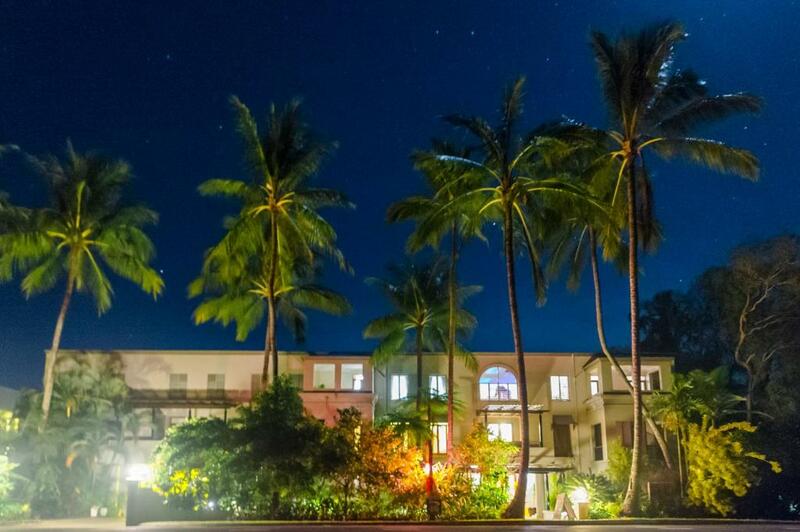 One of our best sellers in Port Douglas! 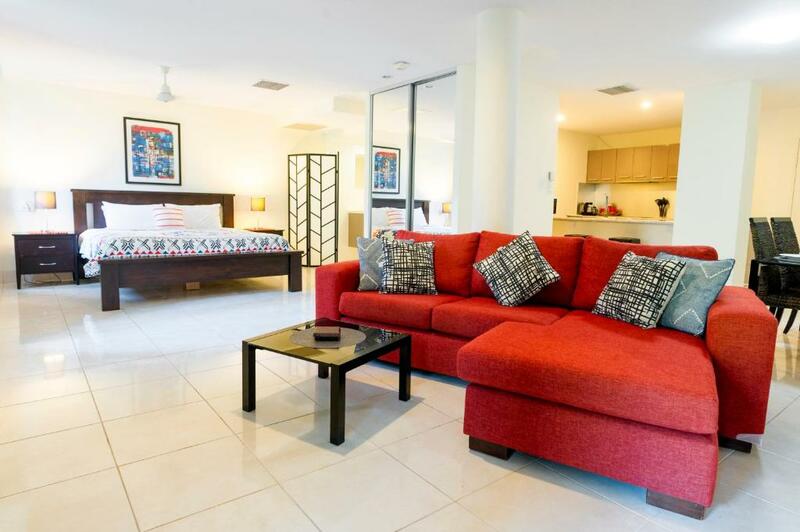 Featuring an outdoor swimming pool and barbecue facilities, Luxury 1 bed Apartment, new King Bed & Bath offers accommodations in Port Douglas, 1.3 miles from Marina Mirage and 1.3 miles from Crystalbrook Superyacht Marina. The property has garden views. This air-conditioned apartment comes with a bathroom with a bath, a shower and a hair dryer. A flat-screen TV is featured. The apartment has a terrace. 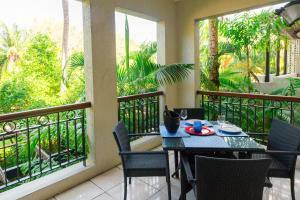 Guests can go hiking or relax in the garden. 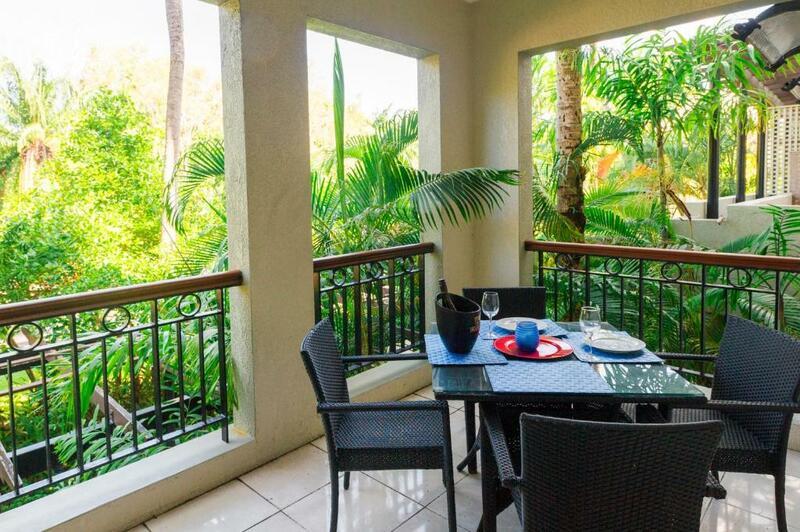 Rainforest Habitat Wildlife Sanctuary is a 17-minute walk from Luxury 1 bed Apartment, new King Bed & Bath. 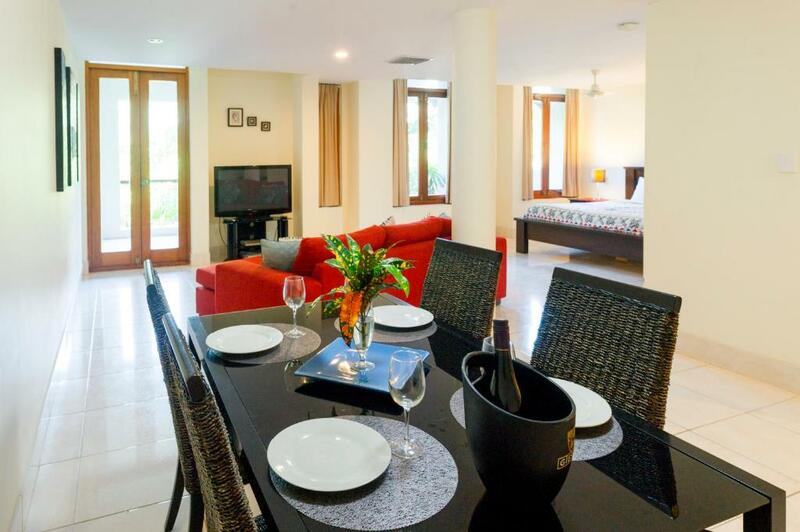 The nearest airport is Cairns Airport, 40 miles from the accommodation. 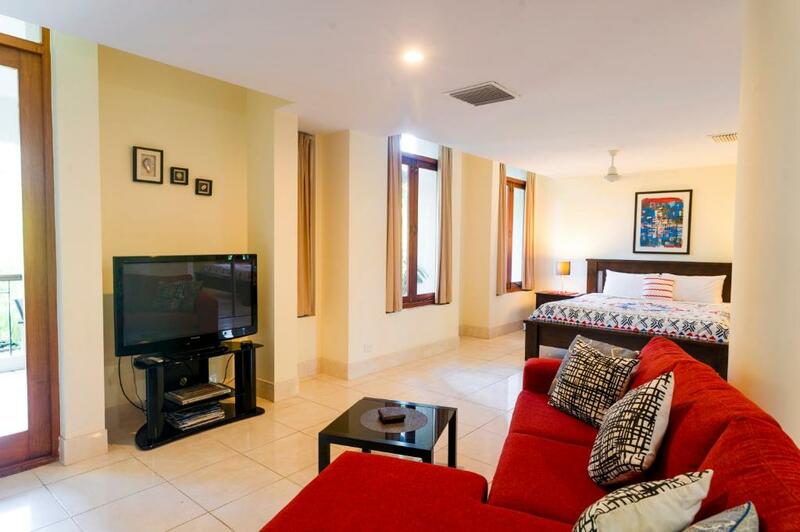 When would you like to stay at Luxury 1 bed Apartment, new King Bed & Bath? 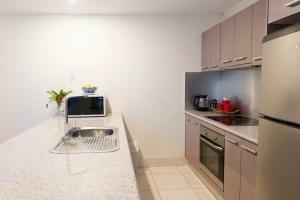 This apartment has a tumble dryer, tile/marble floor and air conditioning. House Rules Luxury 1 bed Apartment, new King Bed & Bath takes special requests – add in the next step! Debit card Luxury 1 bed Apartment, new King Bed &amp; Bath accepts these cards and reserves the right to temporarily hold an amount prior to arrival. Luxury 1 bed Apartment, new King Bed & Bath accepts these cards and reserves the right to temporarily hold an amount prior to arrival. The rain. But no one knows what will happen. Although we didn't care, I think that toilets without doors is not comfortable. The apartment required a few more necessary items, like glass wine glasses, additional toilet paper (half a roll given), bathroom amenities & 2x king singles pushed together. Not much privacy in the bathroom, just a screen from the bed area Had to organise the cleaning person who didn’t arrive when said and did not contact us to say she wasn’t coming that day. We had to follow up. Noisy as it is on a busy road however when you closed the door and windows it was not too bad and we didn’t spend too much time there during the day. There was a funny smell in the hallway, not sure what that was.